Credit: NASA/CXC/Penn State/L.Townsley et al. NGC 3576 is a giant HII region of glowing gas located about 9,000 light years from Earth. 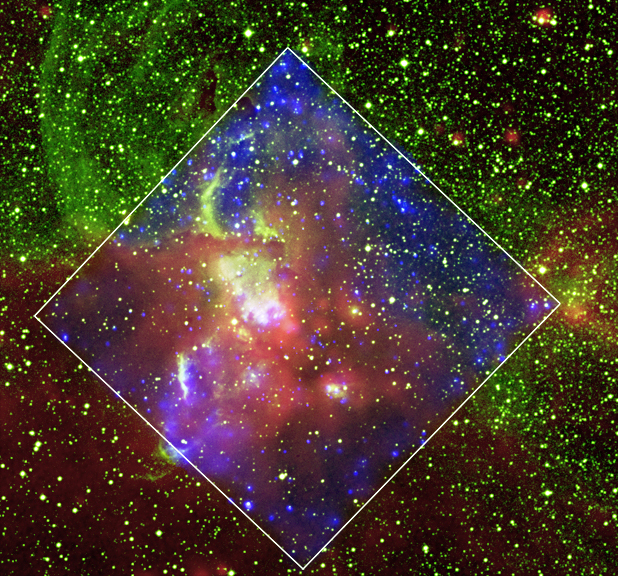 In the Chandra image of this star forming region, lower-energy X-rays (0.5-2.0 keV) are shown in red and higher-energy X-rays (2-8 keV) are in blue. 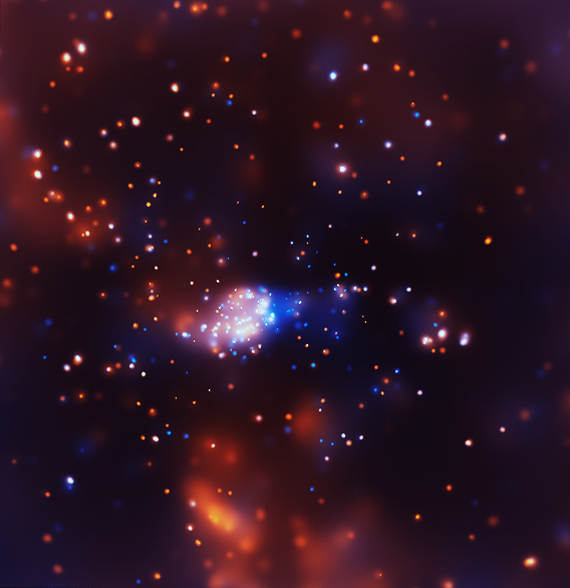 Chandra reveals a cluster of point-like X-ray sources, some of which are massive young stars that are shredding the cloud of gas from which they formed. The blue sources are stars that are deeply embedded in gas. Regions of diffuse X-ray emission are likely caused by hot winds flowing away from the most massive stars. Some of the diffuse gas near the center of the image is also deeply embedded. HII (pronounced "H-two") regions are where stars are born from condensing clouds of hydrogen gas (they are named for the large amounts of ionized atomic hydrogen they contain.) These regions are characterized by hot, young, massive stars which emit large amounts of ultraviolet light and ionize the nebula. Because NGC 3576 is very dense, many of the young, massive stars visible in the Chandra image have previously been hidden from view. A cluster of stars is visible in infrared observations, but not enough young, massive stars have been identified to explain the brightness of the nebula. Astronomers have found a large flow of ionized gas in radio observations and huge bubbles in optical images that extend out from the edge of the HII region. Taken with the X-ray data, this information hints that powerful winds are emerging from this hidden cluster. Credit NASA/CXC/Penn State/L.Townsley et al. Coordinates (J2000) RA 11h 11m 53.80s | Dec -61º 18' 25.00"